Hi all my friends, I haven't been posting for a while because I was so busy with Link Up for Pink for Breast Cancer Awareness Blog Hop, but now I am back on track and will be posting cards more often. I am not really a Halloween type person, I do some, but not one of my favs. I do really like Christmas, so that's what I decided to do here. I have gotten lil' Miss Tilda ready for Christmas, so here she is. Hope you like her. 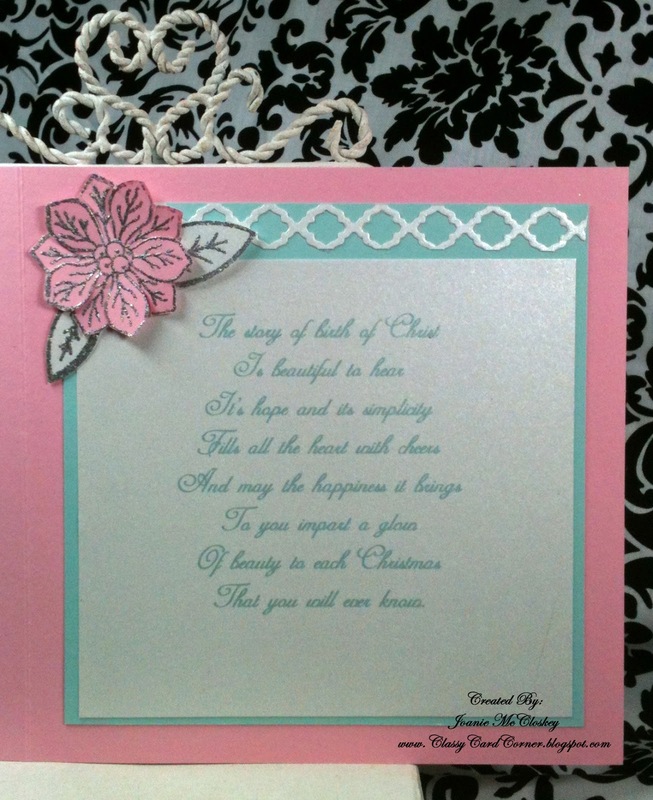 I decided to do a little pink and aqua with some poinsettias in pink and heat embossed with silver to give them a little frosty look. I also like to decorate the inside of my cards as well. Oh my!! This is soooo pretty!! !